While festivals may be a world of fun, loved for their hedonism and free spirited vibe, there is no ignoring or denying the negative impact they have on our environment. Collectively, they are responsible for 15 kilotonnes of carbon-dioxide emissions each year. Audience travel accounts for accounts a staggering 60-80% of this. Determined to help make a difference, Tuned in Travel teamed up with the UK charity Energy Revolution to help lower our carbon footprint and already we have seen inspiring results. Along with Energy Revolution it is our aim to balance fossil fuel miles travelled by giving you, our valued customer, the chance to offset the pollutants generated during your festival travel with an investment into clean, renewable energy. This included the Anglesey Gottwood Festival. 100% of donations made when you purchase your travel ticket with Tuned in Travel will go to towards creating clean energy. 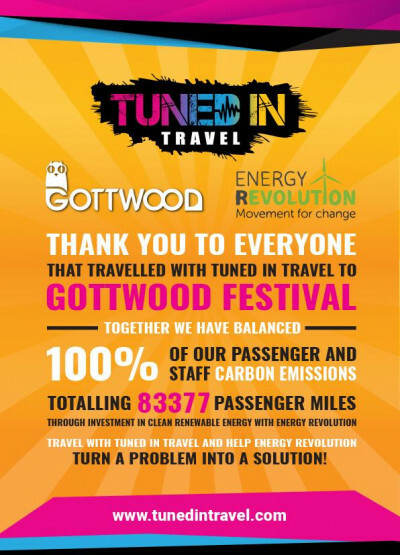 Thanks to all our amazing customers that’s exactly what we were able to achieve while being the exclusive travel partners of Gottwood Festival. Together we offset an outstanding 83377 passenger miles travelled through the investment into clean renewable energy. This result is mind blowing; we are immensely proud and grateful to everyone involved. A HUGE thank you from everyone at Tuned in Travel! Think forward and book all your festival travel with Tuned in Travel. Together we can keep up this amazing work and help to build a brighter, future where the party lives on. Let’s make a problem a solution!